100 YEARS OF VOTES FOR (SOME) WOMEN, AND 90 YEARS OF EQUAL VOTING RIGHTS FOR WOMEN AND MEN. 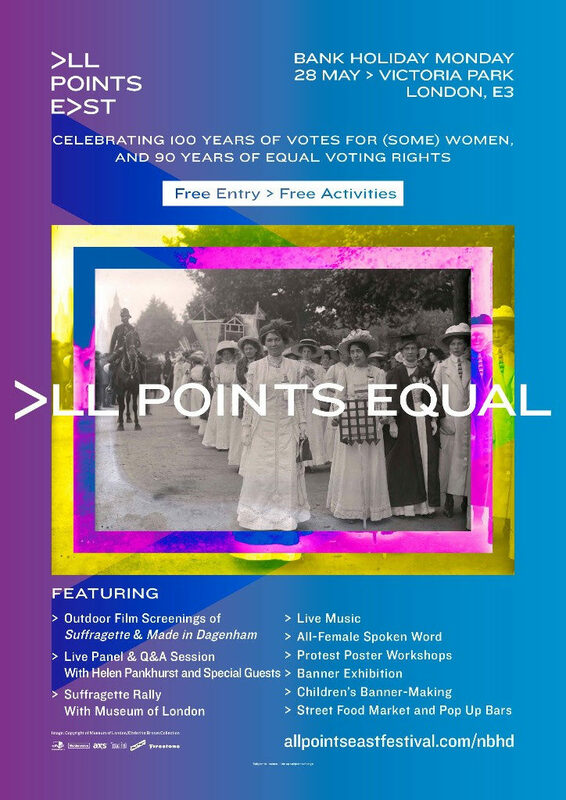 All Points Equal is a day of free entry and free activities to celebrate the 100 years of votes for (some) women, and 90 years of equal voting rights for women and men. Kicking off APE In The Neighbourhood, the weekday programme of free events in between All Points East’s two huge weekends of music, All Points Equal takes place in Victoria Park the end destination of Sylvia Pankhurst’s 1913 and 1914 processions. The vast majority of activities have been sourced from amazing local organisations and suppliers based throughout Tower Hamlets and around Victoria Park. Entry is free entry on a first come, first served basis. Midday – Moana – With incredible music from Hamilton’s Lin-Manuel Miranda, the film sees the titular character team up with demigod Maui to tackle open seas, enormous monsters and impossible odds to save her people. Moana is truly a Disney princess like no other. 3.30pm – Suffragette – Starring Meryl Streep, Carey Mulligan and Helena Bonham Carter, Suffragette tells the incredible story of the young group of women galvanized by political activist Emmeline Pankhurst to fight for equality in 20th-century Britain. 7.00pm – Made in Dagenham – Set in 1960s Britain, Made In Dagenham is a dramatization of landmark strikes protesting sexual discrimination against female workers at Ford’s Dagenham car plant. At 3pm the All Points Equal screening of Suffragette will commence with a fully immersive rally, in partnership with the Museum of London. In February 1918, after over half a century of campaigning, a parliamentary bill was passed that gave some women the right to vote in the UK, step back in time with the Museum of London for a special Suffragette rally and hear speeches that would have inspired the likes of Emily Wilding Davison. The rally will then take you on a journey through time, right up to present day feminism. This is a participatory performance with all encouraged to join in! At 5.30pm Following the screening of the movie ‘Suffragette’ there will be a panel and Q&A with four female speakers. Each speaker will have a chance to talk about the movie, their campaigning work and answer any questions the audience may have for them. Dr Helen Pankhurst is a women’s rights activist and senior advisor to CARE International, based in the UK and in Ethiopia. Helen is the great-granddaughter of Emmeline Pankhurst and granddaughter of Sylvia Pankhurst, leaders of the British suffragette movement. She will be joined by renowned author and the owner of Women and Her Sphere Elizabeth Crawford, author and co-founder of the East End Women’s Museum Sarah Jackson and Royal Albert Hall Archivist and author Suzanne Keyte. Award-winning literary arts company Penned in the Margins will bring a compelling programme of female spoken word artists to All Points East, including an all-female line up on the Monday featuring award-winning writer and performer Hannah Silva and Rachel Long, the founder of Octavia – the poetry collective for women of colour. As part of the day’s workshop line up, from 3pm – 5.30pm you can make your voice heard in this creative session lead by Hackney Arts, making protest posters to celebrate women’s right to vote. All materials are provided as we join together to create powerful and positive messages in solidarity with our sisters in history who made this possible for all of us. Come prepared with your personal messages to make your own sign and share your statement with the world. The workshops are delivered by all female artists all week! Digital Drama has been working with community groups and artist Becci Kenning of art-in-transit.com to create 100 Banners inspired by the suffrage banner collection held in the archives of the Women’s Library at LSE. 100 Banners is an artistic response to the campaigns run by Suffragettes and Suffragists in their ambition to achieve women’s equal voting rights. Inspiration for the banners has come from local stories of women through history who have stood up for their rights and of places that have become iconic in suffrage history. 10 of the banners from the collection will be displayed on our Monday celebrations. Tower Hamlets charity Stitches in Time uses the arts to bring all kinds of people together. At All Points Equal we invite you and your family to roll up your sleeves and join this creative community. On Monday from 11am – 5pm there will be a special suffragette ‘banner making’ workshop. This incredible programme is a part of All Points East the brand new ten day event taking place from 25th May to 3 June 2018 in East London’s beautiful Victoria Park, Tower Hamlets. Kicking off on the May bank holiday will be a three day music festival with a thrillingly diverse line up of some of the coolest names in music. Following the opening weekend, APE In The Neighbourhood a 4-day community focused midweek event will deliver an entertainment programme of comedy, food, outdoor cinema and more to reflect the vibrancy of its surrounding area. The event culminates the following weekend with three huge standalone APE Presents… headline shows with some of the most exciting acts around.